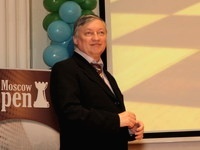 Ex-world champion Anatoly Karpov told about history and prospects of the festival. - When the festival only began, nobody thought that it would increase till such big size � today Moscow open beats all records, - he noted. The university created remarkable conditions for festival. Today RSSU is serious base for development of chess. And not only sports, higher skill, but also curriculums. In the near future the international seminars will be organized, there is already begun the program on development of chess at schools, and I think that all will develop in a positive direction in the future. International Chess Moscow Open 2009 festival taking place in Russian State Social University (January 31st � February 8th) has finished today on Sunday evening. International Grandmaster Alexander Onischuk (USA) has won the main tournament of the festival. In final round his game with Sergey Tiviakov (NED) ended in a draw and he got 7.5 points from 9. Other competitors have lagged behind on 0.5 points. Natalya Pogonona leaded in the female tournament �C�. She defeated Marina Romanko and got 8 points among 9 and went one point ahead the opponent. The duel Alexander Riazantsev (RUS) � Alexander Zubarev (UKR) noted by our commentator Alexander Kalinin among 8th round games. There White has succeed to attack "hedgehog" Black construction. Festival Moscow Open 2009 taking part in Moscow comes to the end. Penultimate round finished on February, 7th. Only one party in group of leaders in the main tournament �A� came to the end productively: Alexander Onishchuk (USA), won against Boris Savchenko (Russia) by black. Before the last round Onishchuk individually heads tournament with 7 points from 8. The group of the pursuer who are lagging behind on a half-point, includes Ernesto Inarkiev, Nepomniachtchi Ian (both Russia), Sergey Tiviakov (Netherlands), Viorel Iordachescu (Moldova). They finished the games in a draw, and also Alexey Korotylev who has won Artyom Timofeev (both Russia). Central game of tournament �C� between two Russians Natalia Pogonina and Svetlana Matveeva finished in a draw. This result has allowed for Pogonina keep the first line in standings having typed 7 points from 8. Competition between school champions (tournament �» and �E�) finished at international festival Moscow Open 2009 on Saturday. There were 537 participants from Russia, Ukraine, Belarus, Azerbaijan, Uzbekistan, Kyrgyz, and Tajikistan. At a closing ceremony of tournaments �D� and �E� the vice-president of Moscow Chess federation, the president of the International School Chess Union Alexander Kostiev has noticed that the festival celebrates anniversary � children's and adult tournaments are spent at RSSU for 5 years. However it is not unique date. Tournament schools champions are celebrating today the 10th anniversary - the International School Chess Union was formed 10 years ago. In 1999 qualifying tournaments to the European championships and the World among schoolboys have started to be held. The tournament approaches to finish. Pressure of the struggle has increased and the weariness starts to affect. No wonder, that participants showing the most interesting plans, also supposed some errors which have deformed a logical course of many duels in the 7th round games. In this connection the game Tiviakov - Vaganian, having spent in good tournament style, deserved to be noted be our commentator GM Alexander Kalinin. The games of 7th round were played on Friday at International Moscow Open 2009 festival. At female tournament �C� Natalia Pogonina, a member of Russia team, got leadership and moved into the top of the tournament table. She defeated Varvara Repina using Black chess. Pogonina scored 6.5 points afterwards. The quintet of the leaders who scored by 6 points was formed in the main tournament �Open A�. In 7th round the games between Alexander Onischuk (USA) and Ian Nepomniachtchi (RUS), Artyom Timofeev (RUS) and Ernest Inarkiev (RUS) ended in a draw. Thanks to this, 2 more chess players were allowed to enter this lead group � Sergey Tiviakov (NED) and Viorel Iordachescu (ROM). They defeated Rafael Vaganian (ARM) and Alexander Riazantsev (RUS). 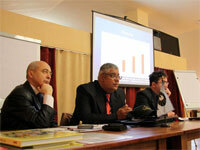 FIDE Arbiters Seminar takes place in RSSU as part of �Moscow Open 2009� festival. International arbiters Panagiotis Nikolopulos (Greece) with the participation of Eduard Dubov (Russia) are in charge of this festival. - Moscow Open 2009 festival is the one of the largest tournaments around the world � quantity of participants really impresses us every time. Lots of strong chess players take part in this festival. As the matter of fact, high image and big prize found attract participants� attention. This tournament has high level of organization, arbiters work very professionally. The winner of Moscow Open 2008 ArtemTimofeev has won a beautiful game against Pavel Smirnov in the 6th round of tournament "A" . This duel can become an excellent example of exchange sacrifice. Games of 6th round have been played at the international festival Moscow Open 2009 on Thursday. Russians Natalia Pogonina and Varvara Repina are leaders in the tournament �C� of festival Moscow Open 2009. Pogonina won against less skilled compatriot Karina Ambartsumova in the 6th round. At the same time Repina the silver prize-winner of the European championship 2008 in an age category till 16 years, has presented sensation, having beaten Shen Yang from China national team. Leaders have 5,5 points, seven chess players have on a half-point less. In the main tournament open �A� the table is headed by three chess players. They are Nepomniachtchi Ian, Ernesto Inarkiev (both is Russian) and Onischuk Alexander (USA). After 6 rounds they have typed 5,5 points. Five participants have 5 points. In the game of the 5th round between Igor Kurnosov and Pavel Dvalishvili White used Black's risky strategy effectively. The big half of distance is passed at Moscow open 2009 festival. In the main tournament of festival open �A� there was an individual leader. It is Nepomniachtchi Ian, who won by black against Pavel Smirnov (both are from Russia). The 18-year-old chess player became the winner of other prestigious Moscow festival �Aeroflot-open� last year and also has divided 2 place in tournament of 18th category FIDE in Dortmund (Germany). Six persecutors are behind in a half-point. They are Ernesto Inarkiev, Vitaly Tseshkovsky and Igor Kurnosov from Russia, Dmitri Svetushkin from Moldova, Sergei Tiviakov from Holland the current champion of Europe and Alexander Onischuk the USA champion 2006. The Qualifying Round of the World School Chess Championship 2009 is going on as the part of �Moscow Open 2009� festival. More than 300 games are being held in first half of day. In �D� tournament, the Open Qualifying Round of the World School Chess Championship, 8 participants defeated in all games after the fifth round. In �Open E� � qualifying tournament for the World School Team Chess Championship � leads the team named �Privolzhanin� from gymnasia �6, Kazan. Two years ago the team from that school has already won in the World School Team Chess Championship. - There are several reasons in my participating in �Moscow Open�. Firstly, it is very serious festival where I have an opportunity to play with strong competitors. Secondly, I study at the Russian State Social University and spend lots of time in here. Therefore it�s easier to play here for me. Besides, this tournament has very high prize fund. See details in video review of the tournament 4th day. Not faultless, but rather substantial and dramatic game between Farrukh Amonatov and Vitaly Tseshkovsky caused a storm of emotions of its spectators. At a sight of our commentator Alexander Kalinin, this game deserves to be noted, as the most interesting in the fourth round. At festival Moscow open 2009 the next, fourth round has come to the end. While to festival it is safely possible to apply expression: �Native walls help�- many students of chess chair of the Russian State Social University (RSSU), taking part in festival tournaments, started successfully. The absolute indicator is kept by four sportsmen in the main tournament of festival �Open A�. There are two students of RSSU among them. They are Ernesto Inarkiev the participant of a series of Grand prix of FIDE and Nepomniachtchi Ian the winner of prestigious festival �Aeroflot open�. Pavel Smirnov (Russia) and Dmitry Svetushkin (Moldova) also have absolute indicator. It should be noted that last year at festival Moscow open Inarkiev has show a 7 victories series, but having suffered defeat in a final decisive round from Artyom Timofeev the future winner of tournament, and he has appeared out of prize-winners. Grandmaster Elmira Mirzoeva represents video-review of the�third day of the tournament. The International science-practical conference �Chess within the system of education in Russia and in the world� which took place at the Russian State Social University (RSSU) finished on Tuesday. The conference was dedicated to the problem of chess integration into education program in many countries and was organized under the aegis of World Chess Federation (FIDE). Two representatives of the federation have done their reports - the Chairman of the FIDE committee �Chess in school� professor from Venezuela Uvensio Blanco and the chairman of the FIDE coach committee Russians Jury Razuvaev. The final resolution was adopted after the conference. It was recommended to government institutions to work out the problem of introducing into the state classifier the new profession �Chess teacher in the initial classes�. Also the recommendation of the Russian chess federation about carrying out of the next congress during 39th chess Olympic Games in Khanty-Mansisk autonomous region devoted to questions of chess education has been accepted. Grandmaster Elmira Mirzoeva represents video-review of the�second day of the tournament. According to our expert GM Alexander Kalinin�s opinion the most interesting game in the third round at the international chess festival Moscow Open 2009 was the battle between Russian GM Vladimir Burmakin and GM Rasit Ziatdinov who live in the USA. One-third of distance has been passed at the International Chess Festival "Moscow Open 2009". Success of the young chess players definitely draws our attention. 15-year-old Alina Kashlinskaya (RUS) defeated Kirill Brizgalin, an experienced Grandmaster, in the last round. Third round, where participated 12-year-old International Master Ilya Nizhnik (UKR) and Russian chess ex-champion, a winner of �Moscow Open 2006� festival, Alexander Lastin, ended in a draw. Previously Nizhnik took part in �Moscow Open 2007� when he was 10. He became the winner of the chess tournament in Group �B�. It is necessary to draw attention to a high degree of performance in the third round of the �Open A�. Among 20 chess tables only 5 games ended in a draw. After 3 rounds 16 participants have 100 percent result. There�s a participant of FIDE Grand Prix, RSSU student, Ernesto Inarkiev among them. International science-practical conference �Chess within the system of education in Russia and in the world� takes place at the Russian State Social University (RSSU) under the aegis of World Chess Federation during the first days of chess festival Moscow Open 2009. Research officers from 6 countries have come to Moscow to participate in the conference and to discuss main development directions in the system of education in Russia and abroad. The conference covers both theoretical and practical lines of chess overall education. The head specialists from all over the world made their reports on this topic. A lot of famous specialist took part in the discussion of infant chess development topic. Among them are: professor of the Warsaw University of the Physical Culture Agneshka Urban, President of the infant chess fund �Morsko Konche� Boris Khristov (Bulgaria), expert from the Institute of theory and history of education of the Russian Education Academy Igor Georgievitch Suhin. The president of the International School Chess Unit Alexander Kostyev presented a speech named �Problems of chess education in Russia and abroad� on the first day of the conference. The Chairman of the FIDE committee �Chess in school� professor from Venezuela Uvensio Blanco told about measures taken by World Chess Federation on involving chess into the school program. The game between FM Vladimir Seliverstov (RUS) and GM Ivan Popov (RUS) from the 2nd round is being commented by Alexander Kalinin. Games of the second round have come to the end at the international chess festival Moscow Open 2009. In the female tournament "C" two representatives of Ukrainian team, favorites of competition GM Anna Ushenina and Natalia Zhukov finished games in a draw with Russians Svetlana Bezgodova and Tatiana Bogumil. Defeat of the Russian state university student, the participant of the Russian championship Superfinal Valentina Gunina from compatriot Lyudmila Karpova also became unexpected. Grandmaster Elmira Mirzoeva represents video-review of the first day of the tournament. The first International �Moscow Open 2009� tournament has finished on Sunday 1st. That is called the World Chess Composition Tournament. George Yevseyev, a multiple World champion and GM for Chess Composition, won the competition. As the result he scored 80 points for all 4 rounds. Alexander Leontjev got the second place and Valery Kopyl has the third one. He scored 71 points. The main judge of the World Cup, a vice-president of FIDE, Andrej Selivanov noticed that the line-up of this tournament was extremely strong. - Russia has lots of chess solvers, and Chess Composition became more popular. George Yevseev (the multiple World Champion) and Boyan Vuckovich (GM and the member of Chess team Serbia) took part in that Cup. Boyan�s also participating in the main tournament of festival. Also there were Oleg Pevarkov (a helpmate World Champion), juniors Andrej Petrov and Evgenij Viktorov. The game between grandmasters Alexey Alexandrov (Belorussia) and Pavel Kotsur (Kazakhstan) is being commented by grandmaster Alexander Kalinin. Chess first round games were played on Saturday 31st January. Chess players from more than 30 countries continue to compete for the main awards. The drawing of the first three rounds in Open �A� was held with the use of new methods. The point is that participants with higher level get their competitors with the same level. Therefore in the first round the most of the games ended in a draw. This doesn�t usually happen. First game, where Dreev Alexey (RUS) competed with Vasilij Emelin (RUS), ended in a draw. Last year�s winner Artyom Timofeev neck-to neck with Alexander Zubov. 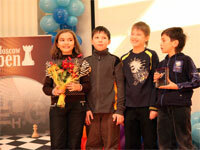 The young chess players and solvers show started the international festival Moscow Open 2009 on Saturday morning. Champion�s of comprehensive schools tournament is a selection to the World championship among pupils which will take place in Greece in April-May. 606 persons who are separated on some age subgroups (boys take part in this tournament and girls compete separately): till 9 years, 11 years, 13 years, 15 years, 17 years. Young chess players not only from Russia, but also from Ukraine, Belarus, Azerbaijan, Uzbekistan, Kirghizia, Tajikistan have arrived to Moscow. The World Cup on solvers show is spent for the first time within festival Moscow Open. 26 participants from 5 countries take part in tournament. There are George Yevseyev GM of solvers show, multiple World champion, Russian Alexander Azhusin the international GM of solvers show, Bojan Vuchkovich from Serbia. The MM Evgeniya Chasovnikova from Russia is the one girl participated in a cup. The opening of the fifth international Chess Festival "Moscow Open 2009" has been held in the Russian State Social University. The organizers of this Festival warmly welcomed participants after the introduction. The head of the Moscow City Department of Physical Culture and Sport Mikhail Stepanyants underlined that Chess Festival is a significant event in Russia and this year it became an annual event. Also he noticed that 1579 chess players would take part in �Moscow Open 2009�. - The Festival gives juniors a chance to acquit themselves and give a shot. An example, that is being shown all the time by GM, provides a powerful impetus for living and sport. Let's meet on Moscow Open 2009! Next year the Russian state social university is going to increase the prize-winning fund of the fifth international chess festival "Moscow Open" up to 7 000 000 rubles. It was declared by rector of RSSU, the academician of the Russian Academy of Science Vasily Zhukov. The closing ceremony of the 4th International Chess Festival �Moscow Open 2008� was held in Russian State Social University. The president of International chess federation Kirsan Ilyumzhinov has congratulated participants on the finish of the festival, has thanked all organizers who had supported the tournament. �More than 1200 chess players have taken part in the festival, about one million visitors has been fixed these days on the tournament website�, - Ilyumzhinov has noted. �The festival beats all tournaments records which are passing under FIDE aegis�. The president of Moscow Chess federation Vyacheslav Beresnev has noted an increased importance of the festival in International, Russian and Moscow calendars, having promised next year to make it even better. The rector of Russian state social university Vasily Zhukov in his speech has noted that for nine days the intellectual capital of the world has moved in RSSU and participants have filled it both with struggle and a holiday.